Leicester host Manchester City in a much anticipated Carabao Cup quarter-final this Tuesday night. Are you placing a bet on this match? 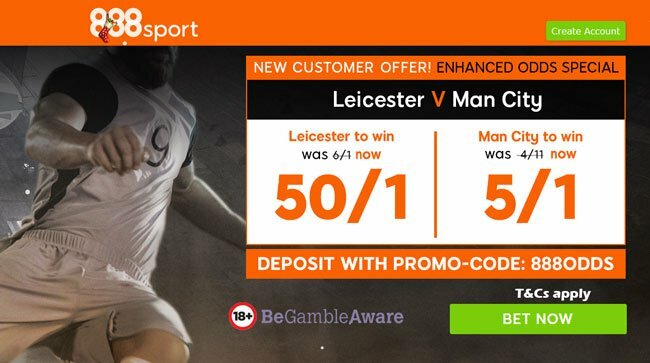 888sport are offering special offd - Leicester to win @ 50/1 or Man City to win @ 5/1! Max bet £5! Leicester was in fine form before this weekend, having won four matches on the bounce before the mishap in the 3-0 home defeat to Crystal Palace on Saturday. Manchester City enter this match on the back of another impressive display display in the 4-1 trouncing of title rivals Tottenham. The Citizens dominated proceedings and won 2-0 when they visited the King Power Stadium in the league earlier this season. 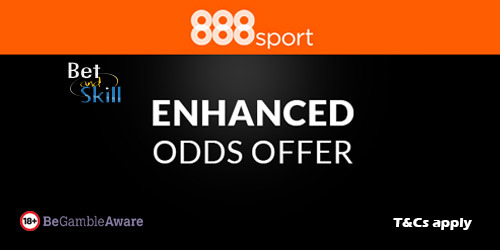 Join 888sport and get a price boost on either side to win the clash - 50/1 Leicester or 5/1 Manchester City! Min bet £5, max bet £5. Free bet stakes not included in bet returns. Free bets expire 7 days after credit. "Claim 50/1 Leicester or 5/1 Man City to win (888sport enhanced odds)"